Fla. Flirts With Deadline To Join Oil Spill Suit Gov. Rick Scott has until April 20 to decide whether to join a consolidated lawsuit to recoup economic damages. While he talks tough about getting the state's fair share, the governor, elected on a pro-business platform, has so far balked at joining the suit. The one-year anniversary of the Gulf oil spill is April 20; that's also the deadline to join a massive lawsuit to recoup economic damages from the companies involved. It may seem simple: You get wronged, you sue. 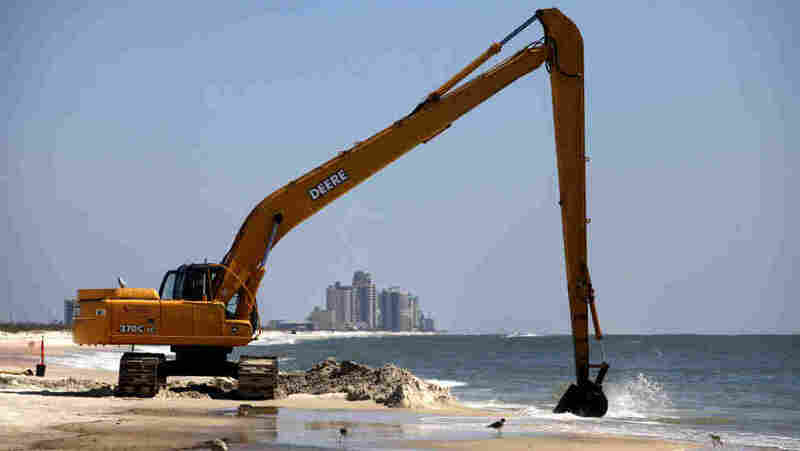 But when you up the stakes to include the oiled shoreline of four states and economic damages to thousands of fishermen, hotel operators and restaurateurs, the political waters can get muddied. Florida Gov. Rick Scott isn't making the situation any clearer. He talks tough about getting the state's fair share of the damages: "We will continue to hold BP accountable to Floridians, and the Floridians and the businesses who lost millions of dollars because of the oil spill." But he's balking at joining a consolidated lawsuit against Transocean, the operator of the Deepwater Horizon rig that exploded last April, killing 11 workers and setting off a massive spill that took months to contain. As for BP, which leased the rig, Scott says he'd rather negotiate than litigate. Earlier this week, he celebrated a pledge of $30 million from BP to promote tourism in Florida's Panhandle. Steve Yerrid, who served as special counsel on the oil spill to Scott's predecessor, former Gov. Charlie Crist, has another description of that money: "chump change." Yerrid has tried to contact Scott with his findings three times. Three times, he got no response. He says the governor owes it to Florida taxpayers to get all the money he can. "I know that we had a viable claim," Yerrid says. "We can argue over the money — OK, if it wasn't $2 billion, it was a billion; if it wasn't a billion, it was $500 million. It was a hell of a lot of money." Scott was elected on a pro-business platform. And that, says University of South Florida political scientist Susan MacManus, is coloring his strategy. "He's reticent to sue — he pursues every other avenue possible," she says. "And I think that this is consistent with his business philosophy." Louisiana and Alabama aren't hesitating. Those states have joined the lawsuit against Transocean, which is likely to include finger-pointing at who's responsible — BP, Transocean, or oil services company Halliburton. Alabama's top officials, Gov. Robert Bentley and Attorney General Luther Strange, even recorded a PSA encouraging people in that state to join the lawsuit. Yerrid says Scott has less than a week to make his decision, or the state may be left out of that settlement. "This governor has run up on a deadline, which they can minimize, they can ignore or they can utilize," he says. "The problem is, it is a deadline, and I hope we don't end up being dead wrong." A spokesman for Scott says the state may still sue BP, but they want to keep their options open.